Horatio Nelson (1758-1805) - One of Britian's greatest heroes and sailors, Admiral Nelson served in the Royal Navy with great valour and distinction. To this day he ranks among England's most admired figures in its history. Although he is remembered primarily for his final battle, his career in the British navy was a long one going all the way back to the American Revolution. And he began sailing even earlier. His maternal uncle, Captain Maurice Suckling, is the one who encouraged young Nelson to make a career out of the navy. In 1777 he passed his officers' exam and received his first command only a year later. Most of his time during America's war for independence was spent in the Caribbean away from the heaviest action. But he became indispensable to England during the war against France at the time of Napoleon Bonaparte. In 1798, he pursued the French navy across the Mediterranean during Napoleon's famous expedition to Egypt. At the Battle of the Nile, the Royal Navy destroyed or captured 13 French ships, including the destruction of the flagship, Orient. This victory allowed Britain to dominate the seas and temporarily cut Napoleon off from France. It also foiled Bonaparte's plans to eventually conquer India and thereby end a major source of British revenue. But his most famous victory was at the Battle of Trafalgar in 1805. France had allied with Spain in order to bolster its navy and was trying to re-establish control of the seas and launch an invasion of the British Isles. 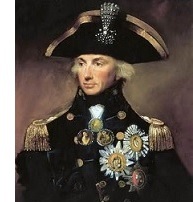 Though outnumbered and out-gunned, Nelson employed unconventional naval tactics and crushed Napoleon's fleet. The Royal Navy sank 22 ships without losing a single one of its own. However the victory was bittersweet in that Nelson was mortally wounded by a gunshot which severed his spine. His crewmen took him below deck where he died. Back in Great Britain he received a state funeral. Out of England's long list of famous sailors, the three listed on this chart (Drake, Cook and Nelson) are probably the most famous of all.